Crocus autumnalis Sm. nom. illeg. Saffron threads are the dried styles and stigmas of C. sativus. ↑ "The Plant List: A Working List of All Plant Species". ശേഖരിച്ചത്: 23 April 2015. 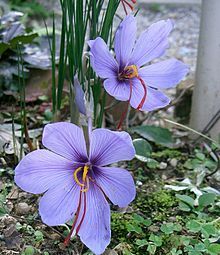 ↑ "Crocus sativus". Germplasm Resources Information Network (GRIN). Agricultural Research Service (ARS), United States Department of Agriculture (USDA). Retrieved 23 April 2015. ഈ താൾ അവസാനം തിരുത്തപ്പെട്ടത്: 04:25, 22 ഓഗസ്റ്റ് 2018.